Apple's firmware 3.0 update for the iPhone and Touch brought with it the ability view game ratings by age and restrict access to certain games on a device. The ability to download and purchase Apps from the App Store can now be limited by rating. The ratings are based on for what age the games are appropriate: No Apps, 4+, 9+, 12+, 17+ and all Apps. The device also allows people to disable the ability to make in-App purchases. It also allows similar policing of movies, music and TV shows. Both the ESA and the ESRB have called for the ratings of games on the Apple devices, suggesting that the ESRB could handle the work. Ngmoco's Neil Young says he doesn't think the ratings board is set up to handle the massive in-flux of games. Under the Apple system game developers and publishers have to police their own games by turning in a form with about ten criteria on it. 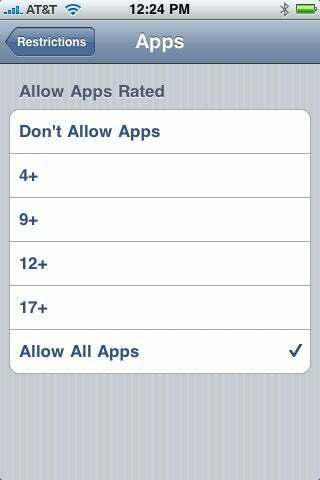 Apple then uses that to assign an age rating. "I would rarther that system than the ESRB," Young said. "Going through the ESRB would slow down and cripple the growth of the App Store. Right now Apple has a very light weight system for approving games, it really helps the time to market for a game. "I think the current system will serve both customers and developers."